Selanne and Kariya are together again. Forever. There was no doubt the Finnish Flash would be among the Hockey Hall of Fame’s Class of 2017, the only question was who would join him. Turns out, the five-year wait for Selanne’s longtime teammate and close friend is over. Kariya was elected to the Hockey Hall of Fame on Monday afternoon, joining Selanne, Dave Andreychuk, Mark Recchi, as well as Team Canada women’s star Danielle Goyette, and builders Clare Drake and Jeremy Jacobs. Six Stanley Cups. More than 2,300 goals. Nearly 5,800 games played. It is quite the class, headlined by Selanne’s unique chemistry with Kariya. “It’s great that you were inducted with me, Paul, so we can fly together and you can pick up the tab for the private plane!” Selanne joked with Kariya on a conference call with reporters. Since retiring from the NHL in 2010 as a result of multiple concussions, Kariya has distanced himself from the game. He was also robbed of a full season in 2004-05 because of the NHL lockout. Kariya has taken up surfing three to four times a week in Southern California – considering Monday a lucky day “because I didn’t get eaten by a shark” - and snowboards or skis in British Columbia in the winter. One of the most dynamic players of his era has been spotted inside Anaheim’s Honda Center just once – and that wasn’t necessarily by choice. Selanne threatened to tie Kariya up and throw him in the trunk of his car if it meant making sure he attended Selanne’s final regular-season game with the Ducks in 2014. Hockey Hall of Fame chairman Lanny McDonald joked Selanne earned his “Finnish Flash” nickname on Monday because he phoned Kariya to break the news before McDonald could even get to Kariya. Selanne joins Jari Kurri as just the second Finnish born player ever inducted. 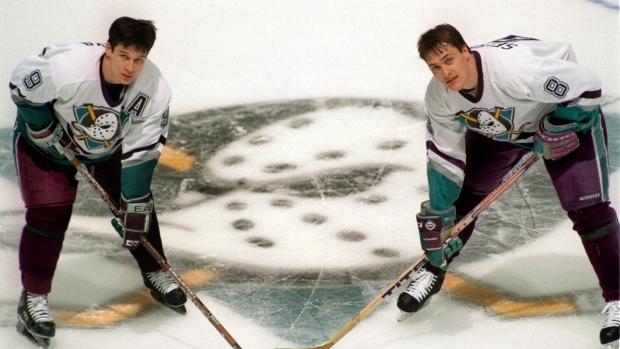 After tormenting the NHL as one of the most highly skilled duos in the league from 1995 to 2000, Selanne and Kariya both decided to sign together in Colorado for a run at the Stanley Cup in 2003. That one star-crossed season together again – playing alongside fellow Hall of Famers Joe Sakic, Peter Forsberg and Rob Blake – didn’t work out quite as planned, falling short in the second round. But they will now be enshrined next to each other permanently. Selanne, now 46, began his career in a way no rookie has ever, leading the NHL with an exhilarating 76-goal season in 1992-93 with the Winnipeg Jets. He carried that pure scoring touch throughout his 21-season career, finishing with 684 goals and 773 assists for 1,457 points in 1,451 games. Selanne finished 11th all-time in goals. Two of his other classmates, Andreychuk (14th, 640) and Recchi (20th, 577) ended their careers inside the Top 20. He owns or is tied for 18 different NHL records. Kariya, 42, netted 989 points in 989 games. Known for not only his skating and vision, but also his lethal backhand – perhaps one of the best backhand shots ever – he finished in the top seven in league scoring four different times. Kariya, Anaheim’s first-ever draft pick, was passed over four times previously. Like Eric Lindros, who was inducted last year, Kariya was an outspoken critic against the NHL’s treatment and prevention of concussions, often saying the league’s rules did not allow adequate protection of players. Kariya said Monday he is perfectly happy living a life outside of hockey, even if Selanne has tried to drag him back in. Kariya said it took him a full year of rehab for him to feel “normal” again after the concussions, but has no headaches or restrictions and lives an active lifestyle. Kariya’s induction will mean that of the 57 players who have been named a first team All-Star at least three times in league history, only John LeClair will not be a Hall of Fame honoured member. Other than LeClair, Kariya was the only one prior to Monday, considering some active players as locks (like Jaromir Jagr, Erik Karlsson, Jarome Iginla and Patrick Kane). Kariya was also the 1997 Hart Trophy runner-up who had a flair for the dramatic, scoring the magical game-tying goal in the 2002 Olympic gold-medal game against the United States, helping Team Canada to gold in Salt Lake City. Each inductee required a minimum of 14 of 18 votes from the Selection Committee. Andreychuk, 53, was selected in his ninth year of eligibility. He captained the Tampa Bay Lightning to the Stanley Cup in 2004 and has scored the most power-play goals (274) in league history. Andreychuk said his heart started racing when he saw a 416 number on his phone Monday afternoon. The first phone call he made was to his parents back in Hamilton, Ont. Recchi, 49, was selected in his fourth year of eligibility. He is one of just a few players in NHL history to win three Stanley Cups with three different teams (Penguins, Hurricanes and Bruins). The 5-foot-10 ‘Recchin Ball’ posted three 100-point campaigns over his 22 seasons and ranks fifth all-time in games played (1,652). “No way,” Recchi said on the call he received from McDonald. Goyette, 51, is one of the most accomplished women’s players ever. She scored the only goal for Team Canada in the inaugural 1998 gold-medal game in Nagano, a tournament in which she tied for the lead in scoring with 10 points. The St-Nazaire, Que., native, finished her international career with 113 goals and 105 assists in 171 games, capturing two Olympic gold medals, one silver, and seven gold medals on the World Championship stage. She was inducted into the IIHF Hall of Fame in 2013 and carried the Canadian flag in the opening ceremonies of the 2006 Winter Olympics in Turin, Italy. Jacobs, 77, is one of two inductees in the builder category. Jacobs has owned the Boston Bruins since 1975. He has been one of the NHL’s most influential owners, known for driving a hard line in collective bargaining, and has served as chairman of the league’s Board of Governors since 2007. The call to hockey’s hallowed Hall was long overdue for Drake, the 88-year-old “dean of coaching” or “Canada’s version of John Wooden.” Drake is best known for his 28-year run behind the bench of the University of Alberta, where he coached the Golden Bears to a 697-296-37 record and six University Cup championships. He remains the only coach to win a national title in both hockey and football in the same year. Drake was instrumental in developing Hockey Canada’s national coaching certification and also coached at the Olympic, WHA and Spengler Cup tournament levels. He received the Order of Hockey in Canada in 2014 and was the inspiration for many current NHL coaches, including Ken Hitchcock, Barry Trotz and Mike Babcock. Daniel Alfredsson was among the first-year eligible players not selected on Monday. Alfredsson will join Martin Brodeur and Martin St. Louis among the headliners eligible in 2018.